School websites that look great – ultra-modern, high quality and on-brand – but are also efficient, responsive, and search engine-friendly. At Refined IT, we make impressive school websites. That’s the simple answer to what we do. The more complex one is that we draw on our exhaustive knowledge of design, technology, and search engine optimisation (SEO) to create a unified approach to school web design. This results in school websites that look great – ultra-modern, high quality and on-brand – but are also efficient, responsive, and search engine-friendly. We design our school websites using WordPress for a few reasons. It’s customisable, which means we can tailor and tweak it until it’s just right for your organisation, ensuring every school website we create is unique. It’s user-friendly, allowing you to update and make changes in just a few easy steps and it’s reliable, so you can depend on it to be glitch-free and consistently high quality. Through the design process, our skilled web designers are always on hand, answering any questions to ensure the final product makes your school stand out from the crowd. Plus, we guarantee each school website is as sleek and easy to navigate on a mobile device or tablet as it is on a computer screen. We also use our SEO expertise to help your school be a formidable force in the online market. Having a strong search engine presence is about more than keywords: it’s a complex methodology that takes time, discipline and an in-depth understanding of the market and our integrated strategy goes the extra kilometre. So you have your website up and running but you need some guidance in editing text, updating the calendar, uploading a newsletter or creating a custom form? Never fear: our dedicated team will patiently teach you to manage the website on your own, answering any technical queries quickly and comprehensively. Great web design goes beyond appearances. It’s also about intuitive layouts that are simple to use and effortless to navigate for students, parents and teachers. 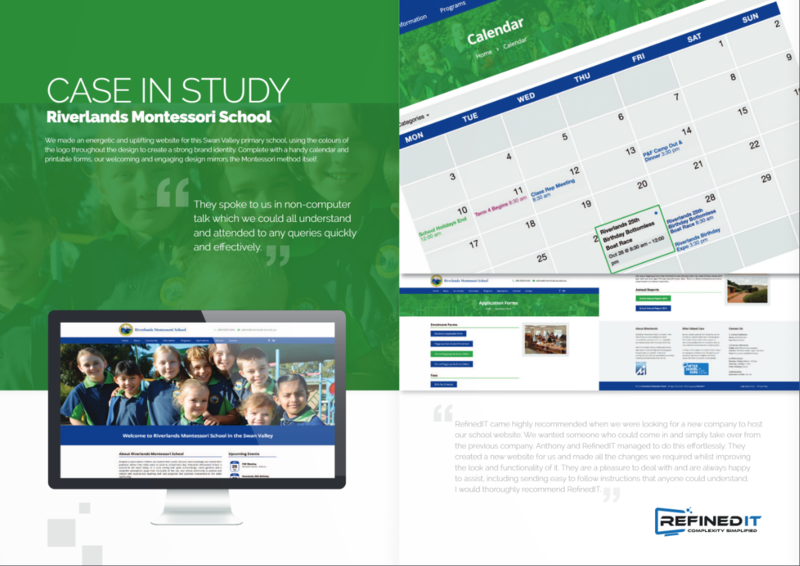 At Refined IT, we pride ourselves on creating fresh, modern and professional-looking websites that never scrimp on functionality allowing your school to make full use of your website, often cutting down on admin to parent paperwork and phone communication. Between managing a school, running staff meetings and attending parent interviews, web hosting added to the pile of work can be a pain. That’s why we offer full-service web hosting, taking the load off you from start to finish. We complement each school web hosting package with our own customised nightly back up service. This means if you ever want to roll back changes to your website we’re here to help, making the hosting experience as painless as possible. Without getting too technical, SEO is a range of techniques and tactics that can help you soar to the top of search engine rankings for your schooling area. Unfortunately, there are no shortcuts – and firms offering band-aid solutions only yield short-term results. We think more long-term with our strategy, centring on consistent quality and content that follows Google webmaster guidelines. We use deliberate keywords, but so seamlessly they’re practically imperceptible. The result? high-ranking websites that outperform the competition and go the distance long term. Sometimes you just can’t get the words right but in a competitive online market, you can’t afford not to. We work in tandem with experienced copywriters to create words that communicate the heart of your school in a polished yet accessible way – while strengthening your Google ranks. 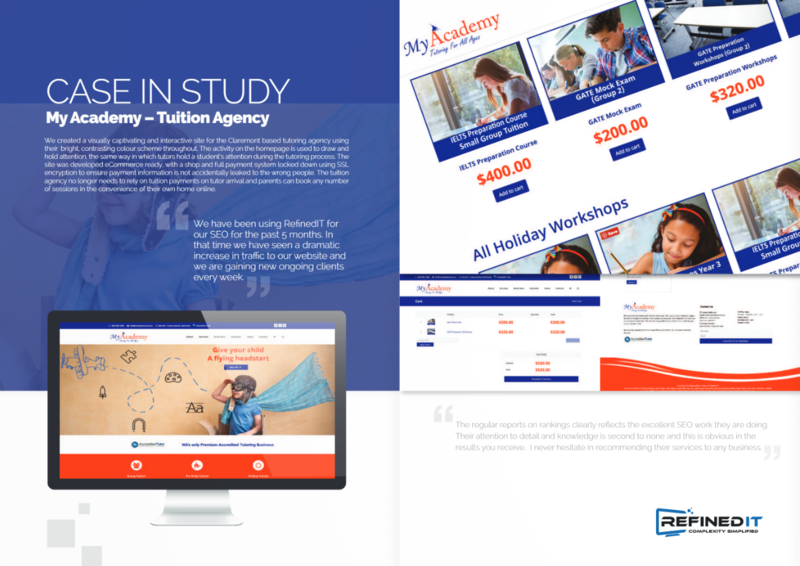 Having professionally-written words on your website not only makes your business seem legitimate, it succinctly conveys information and builds a connection with present and prospective parents, students and staff. We have a proven track record with creating websites for educational institutions. This means we understand the education department and school system – and its unique needs and objectives. Our modern yet classic designs perfectly tow the line between looking fresh and engaging, and keeping with traditional values. We’re also well acquainted with the nuances of schools’ SEO terminology. For example, do people in your state search for ‘high school’ or ‘secondary school’? Do they type in a postcode or do they filter by academic or sports programs? Our SEO experts hone in on precisely what your potential audience are typing into the search bar, then optimise your website so it leads the pack.